So, the Olympics has finally started. I had been planning an article last week about the chaos in the preparation for the Games, the security etc., and the traffic disruption that would result from the Games Lanes which have appeared on various major roads, but later reports said that the disruption was much less than was feared and I had to drive in east and central London on Friday and there was absolutely none — if anything, the traffic was much less than normal and I had only one minor jam on the A13 very close to the centre of town, which wasn’t related to the Olympics. I had been opposed to the Olympics from the beginning, because it represented a huge expenditure on something that would be of dubious lasting value: I believed as I do now that the Olympic accommodation would become luxury flats rather than much-needed affordable homes, and that the sporting venues would fall into disuse and disrepair, as those built for previous Olympics have done. I wonder how much we really need a dedicated water-polo venue, for example. A further issue for me (and many of the people who live very near to the Olympic Park, and indeed many of the athletes) is that it’s Ramadan, and that the fasting days are long because of the northerly latitude and the time of year. I thought it might be better to hold the games somewhere in the southern hempisphere, like Buenos Aires or Cape Town. By the time of the next Olympics, Ramadan will have passed back into June and will not affect the Olympics, so this was the worst one to hold in any northerly location (which includes any of the principal contenders in 2005). The Opening Ceremony started at 9pm which is just the time we were all getting our meals ready, breaking our fasts and praying the dusk prayer, and many of the visiting athletes will be here too long to justify holding off their fast as travellers (unless they go home in between). Many of the problems getting security staff can, in my opinion, be put down to the fact that there is a heavy Muslim presence in the security industry and many of them will not have wanted to be standing around in the summer sun while they are fasting. In fact, many will have booked holidays in advance, and any new security guards would have had to be trained, vetted for criminal records, and certificated. That should have been taken into account long before it seems it was. Still, I did manage to catch a few glimpses of the opening ceremony, which included a performance of the Industrial Revolution, a tribute to the British film industry (complete with an appearance from Mr Bean, AKA Rowan Atkinson, playing the keyboard while acting the fool — not sure foreign or even younger viewers got the joke, but as someone who remembers the show I thought it was quite funny and a classy touch. The bit I did see most of was the tribute to the NHS staff, which also included appearances from JK Rowling and sketches from the film Mary Poppins, so besides being a tribute to British health workers, it was a tribute to British children’s literature and film as it was set on a children’s ward and featured real nurses and patients. I found the way the “cauldron” was lit not to be as well-executed as many people thought: the cauldron was made up of these copper “petals” which were each brought along by a young woman who walked with the delegation from each country, yet as they walked around, people (including myself) were asking on Twitter and Facebook what those objects were and what they were for. The women walked at the side, almost off-camera, and many people could not see the objects they were carrying clearly. I did think the decision not to have a Very Famous Person light the cauldron on their own, but to give the flame to seven young athletes, was an inspired choice. Scott Jordan Harris makes a strong case for Steve Redgrave lighting the flame, but like everyone else (including those who placed bets, which I presume were all lost) assumed it would be an individual. The presence of the Arctic Monkeys was, to my mind, pointless; the song (their best-known song, I Bet You Look Good on the Dancefloor) had no relevance to the event and no grace whatsoever. It was incongruous. I suspect it was done only to show who the band where, as they then launched into an indentikit cover version of the Beatles’ Come Together as the backing for the “doves on bikes” display. The ceremony, and the NHS tribute in particular, provoked a tirade from one Rick Dewsbury, a Mail reporter and opinion writer, on the Mail’s RightMinds blog site. The article has since been altered although the section regarding the NHS tribute remains unchanged; what has changed is a sneering comment on one scene which shows a mixed-race couple. There is a more comprehensive take-down of this particular article here which notes what has changed since the racist tone of the original was widely noted on Twitter and, one suspects, in the Mail’s own comment boxes. He starts off by telling the story of Kane Gorny, who died of thirst at St George’s Hospital in south London after the staff refused him water because his condition (which was on his notes) made him prone to constant thirst; he resorted to calling the police, but they were put off by the doctors’ explanation without speaking to him. The hospital was found at inquest to be at fault in Gorny’s death and there is no dispute about this; another columnist for the same paper has written that she knows plenty of people who have horror stories about that particular hospital. I personally know a number of people with chronic illnesses who have found that the British healthcare system often fails to recognise their conditions, or that doctors look too easily for psychological explanations, often leading to their conditions getting much worse and sometimes leaving them traumatised. However, the medical profession is not the same as the NHS, and the attitudes of the British medical profession are mirrored in many other countries, including those who do not have a national health service. The NHS is a concept, it is a way of delivering healthcare which is funded out of public taxation, which is free at the point of need, and which is under democratic control. I’m sure none of the people I know who have had awful experiences at the hands of nurses and doctors in the UK would even consider calling for the NHS to be abolished; they just want the attitudes and behaviour that led to their ill-treatment to be changed. 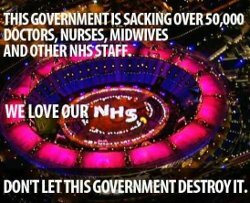 I am sure the image of happy, sweet nurses did strike a sour note with many people, but there are plenty of people whose lives have been saved by the NHS and who are proud of it. A minority of hideous experiences such as those of Kane Gorny and, say, Lynn Gilderdale do not make monsters of most British nurses. (Then again, I found the clustering of beds in a crescent shape in one part of the stage to be rather reminiscent of old long-stay hospitals and asylums. Children’s healthcare in particular has come a long way since the NHS was first established.) The show was meant to be about the “best of British” and the NHS is something most British people value and are proud of. Further on in the article, he attacks the multicultural focus and approves of the tweeted comment by the Tory MP, Aidan Burley, that it was “leftie multicultural crap”. He complains that “almost, if not every shot in the next performance [after the NHS scenes] included an ethnic minority performer”. These are the London Olympics and London is a multi-cultural city, and east London is an area of very heavy Black, Asian and Turkish settlement, so it is natural that they should be heavily represented. Black sportspeople have been heavily represented in past British Olympic achievements, and in sports generally, so it would be quite ridculous to have a white-dominated ceremony with a few ethnic faces. As the ceremony heavily featured British music, much of that was influenced by Black Caribbean and American music and many young people listen to Black music (especially young white women listening to Black R&B), so much as some middle-class white people do not like it, you cannot have a representative sample of British music without including it. But it was the absurdly unrealistic scene — and indeed one that would spring from the kind of nonsensical targets and equality quotas we see in the NHS — showing a mixed-race middle-class family in a detached new-build suburban home, which was most symptomatic of the politically correct agenda in modern Britain. But what will be disturbing to many people is top-down political manipulation - whether consciously or unthinkingly - at a major sporting event. I’m in no illusions about “Olympic spirit”; the games are an overblown corporate event supported by vast amounts of public money which could have been better spent, and it now appears that the public are even less able to attend the games as so many tickets were taken by sponsors which let them stay empty, while the public were called on to work for free at an event that is swimming in money. Still, it does seem to have engendered some community spirit and much of the scepticism seems to have disappeared when people saw the opening ceremony. I didn’t see the whole thing so maybe it did feature some bigoted white backwoodsmen with opinions a lot like Dewsbury’s, but I think his ramblings on the Mail website shows that it was better off without them. Previous story ‘Problem families’: just take them into care?